Justice Gogoi hails from Dibrugarh in Assam and is the son of former Assam chief minister Keshab Chandra Gogoi. 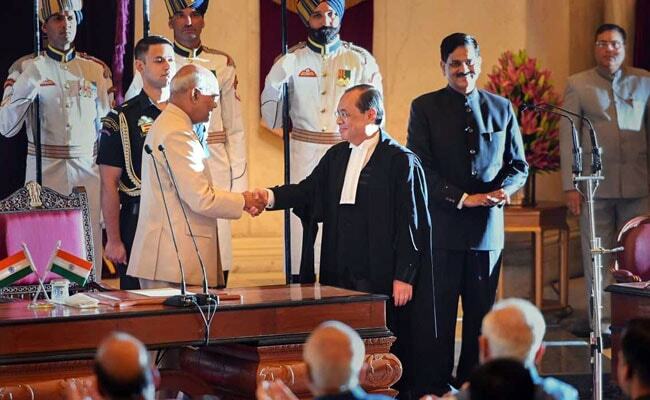 Justice Ranjan Gogoi, who today sworn in as the 46th Chief Justice of India, is the first person from the Northeast to reach the top position of judiciary and will have a tenure of a little over 13 months before retiring on November 17, 2019. He succeeds Justice Dipak Misra who demitted office on October 2. Justice Gogoi had hit the headlines in January by holding a controversial press conference along with three other senior-most judges of the top court in which they virtually revolted against the then CJI over certain contentious issues. He later remarked at a public function that "independent judges and noisy journalists are democracy's first line of defence". A "revolution, not reform" was needed to keep the institution of judiciary serviceable for the common man, Justice Gogoi had said at the same function. Last week, at another public function, he had mentioned about his priority as the chief justice of India to combat the backlog of cases . On Monday at the farewell function for Justice Misra, Justice Gogoi was said people are divided "more than ever" along the lines of caste, religion and ideology and what one should wear, eat or say are no longer insignificant questions about personal life. The judge was of the view that beliefs must be constantly evaluated on the touchstone of constitutional morality which must prevail when there arises any doubt or conflict and had said this is true patriotism to the Constitution. Justice Gogoi brushed aside the claims that the system had not fared well and said despite odds, a number of judges were committed to the cause. "System has done well. In spite of odds we have a lot of committed judges committed to the cause and they will continue to be committed regardless of the inadequacies in terms of remuneration, in spite of the possibilities of abuse of their names," Justice Gogoi had said, adding, "We don't have to be alarmed of that. It comes with the system". Justice Gogoi hails from Dibrugarh in Assam and was born on November 18, 1954. He did his schooling in Don Bosco School Dibrugarh before studying history in Delhi University's St Stephen's College. Son of former Assam chief minister Keshab Chandra Gogoi, he was enrolled as an advocate in 1978. He practised in the Gauhati High Court on constitutional, taxation and company matters. On September 9, 2010, he was transferred to the Punjab and Haryana High Court. He was appointed the chief justice of Punjab and Haryana High Court on February 12, 2011 and then a judge of the Supreme Court on April 23, 2012. Justice Gogoi has delivered various significant judgments, including Assam's National Register of Citizens (NRC), setting up of special courts to exclusively try MPs and MLAs, Rajiv Gandhi assassination case convicts for remission of their life sentences and appointment of anti-corruption ombudsman Lokpal among others.